Australia is definitely on the bucket list! This one is on the top of my bucket list as well. An amazing land! I am amazed to see the smoothness of the mountain. Beautiful! What an awesome layout. I just can’t take my eyes off of it. This is a true work of ART!!! Visiting Australia is my #1 bucket list item! I love what u have done. Dot paintings tell a story all of their own which is what makes each one so unique – just like the pages we make! Very inspired and creating a special page for my grandson who just lost his m.um after a 3 yr fight with cancer. It is truly beautiful, love the artwork on these pages. Another country to visit on my bucket list. Maybe I need to get a passport first. I’ve never seen this type of artwork before,,,thank you for expanding my world! It’s beautiful and amazing! That artwork is absolutely georgeous…Im sure the picture doesn’t do it justice! I can see those flowing circles in blues and greens with glittery fish swimming around….hmmmmmm. What a fabulous layout. Love the graduation of colours and sizes on the black background – and the use of Liquid Glass – genius! All those dots in the layout are absolutely mesmerizing. So beautiful. Such a beautiful layout! I love the flow of the dots! Inspiring layout. Love the flow of the dots. Great layout! I love this travel inspiration series. Didn’t realize you can actually alter a picture by just changing out something small or large in the paper u choose to surround the picture…no wonder it feels like a long time to ..get it right….but very fun! Just amazing! I wish you would include the name of this talented and patient artist. 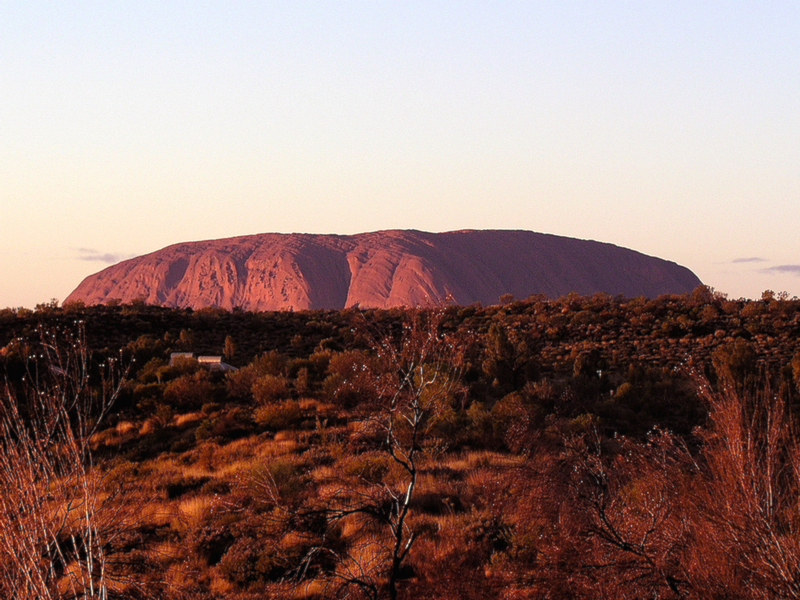 Australia is the one that I missed… Oh my, it is so gorgeous. The picture lay out is a wonderful idea. That paper in absolutely gorgeous. I sure wish I could go on these trips… What a wonderful treat that would be. No, I didn’t miss it…It is beautiful. I think that this is just a wonderful idea for us. Thank You from the bottom of my heart… God Bless! Love the layout inspired by the Aboriginal Art! 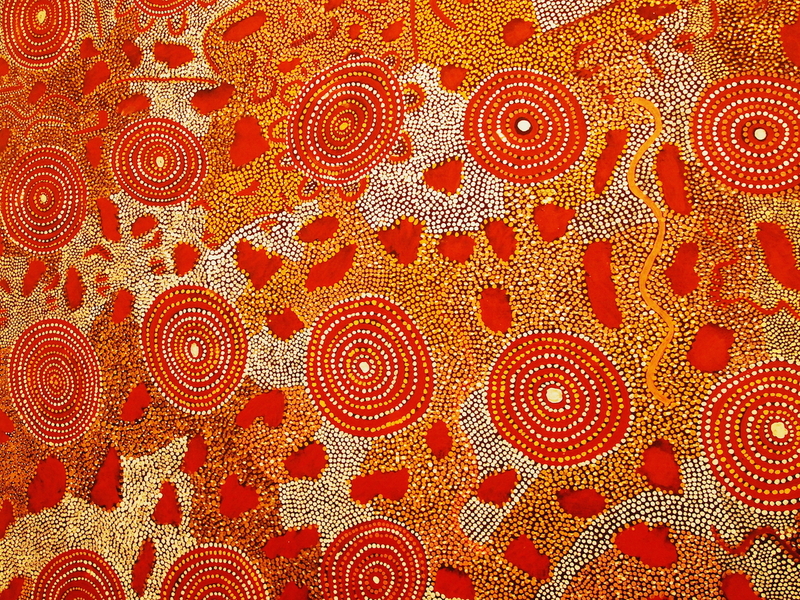 When I took art classes one of my favorite things was pointillism, so I feel drawn to this special Australian look! Thank you for sharing! really inspiring art work with your around the world art. Thanks. 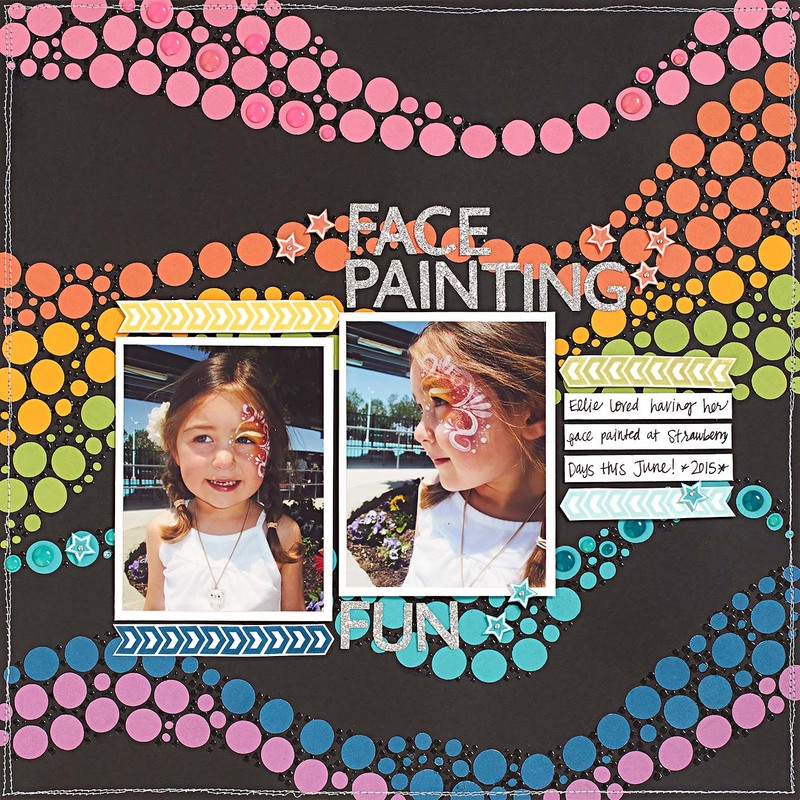 Love the designs on the canvas and how that carried over to the layout with the fun dot patterns! Dot painting seems interesting. I love how that idea is turned to the background of a layout. It is super cool. Fun page! Love the colors! OMG.. love this layout!!! Will deffinately reproduce it!!! What a beautiful page! I love the technique she used to create the different size dots. I love the liquid glass dots! I first thought it was enamel dots. What a great effect. I love the techniques used on this page. It is stunning with the black background. Very cool! What a beautiful layout with the dots. It brings it to life. WOW I never thought to do a page using dots, what a great layout idea. I love how the dots flow across the page, leading the eye. I am often overwhelmed with the number of photos I have and how will I ever get them all on layouts. These dots have reminded me that I should just concentrate on one layout at a time – one little spot by spot – and soon they will build into a beautiful collection.